The falls themselves are beautiful, but too many people visit it now and there are often over 1000 visitors in a weekend. 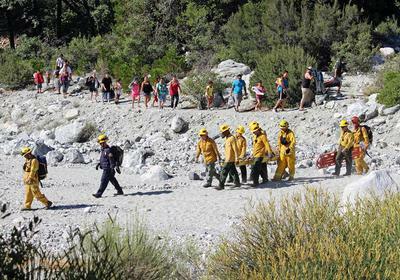 According to locals in Forest Falls, there is a rescue almost every day now – sometimes more. We saw tons of trash on the trail and lots of graffiti. Yuck. Past the railing you can scramble up to the 3rd pool, but beware this is where lots of people fall. There’s a rock up there they call “Blood Rock” and you can actually see where people have fallen and smashed their heads and other body parts on it. The picture is from someone who lives right across from the falls. We won’t be back.